This fizzy and refreshing gin cocktail has a pomegranate syrup and fresh lime. 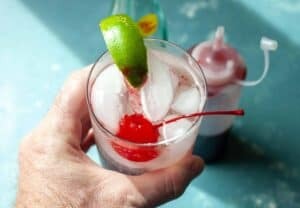 It’s the perfect refreshing, light cocktail for spring (and for doing painful things like taxes)! To make the cocktail syrup, add those three ingredients to a small saucepan and bring to a simmer over medium heat. Stir to dissolve sugar and simmer the mixture until it reduces by about half, maybe 8-10 minutes. Remove syrup from heat and allow to cool. If you stick it in the fridge or freeze, it’ll chill out pretty quickly. Then transfer syrup to a squeeze bottle or jar for storage. Stir together gin and pomegranate syrup in a tall cocktail glass to dissolve syrup. Top with ice, filling the glass up. Top with club soda and stir together. Garnish with a cherry and fresh lime segment. This delicious recipe was brought to you by Macheesmo. Read the full post at https://wp.me/pkSYO-gIp.